Come celebrate Zinck’s Night on October 19, 2017 with your fellow alumni at The Funky Buddha. Saturday, October 28, 7 PM – The Cornell-Princeton football game will be telecast on the NBC Sports network. Go Big Red!! Friday, November 3, 6:45 PM– UPenn Red Carpet Event – Opening Night Film & Party – Fort Lauderdale International Film Festival at Seminole Hardrock Hotel and Casino, 1 Seminole Way, Fort Lauderdale. Click here for details and registration information. It has been a pleasure serving as Cornell Club President. When I joined the Board of Directors back in 2011, I found a community of individuals dedicated to their local Cornell community and enthusiastic about their alma mater. I joined with the intention of giving back to the University that has given so much to me and I have learned and gained so much in return. Thank you all for the wonderful experiences. In July, our Annual Student Send Off, hosted by our very own All Ivy+ Chair Lauren Gould, was a resounding success with almost 60 people in attendance. Students were able to interact with each other and alumni to prepare for a new chapter of their lives in Ithaca. This was followed by our Annual Board Meeting in late August where our new Board of Directors were confirmed. Going forward, your new Co-Presidents will be Diana Hsu and Michelle Talbert. I am confident that with these two in charge, the Club will continue to flourish for years to come. As they plan new activities for our Club feel free to reach out to them with your ideas. Before I go, I encourage you, if you haven’t already, to become more involved in our local Cornell community. There are so many ways to leave a positive impact, both big and small. You could conduct a few contact meetings with prospective students through the Cornell Alumni Admissions Ambassadors Network (CAAAN), for example. If that interests you, please reach out to our CAAAN Director, Dr. Larry Reese. Plus, there are always opportunities to join our Board of Directors or host an event! So farewell for now, I appreciate your continued support of our Cornell Club and hope to CU soon at future events! Join us for the Annual Student Send Off! Please join us in welcoming the newest members of our Cornell community at this year’s Student Send-Off! Every year, local Cornell clubs across the country get together and host a Student Send-off for incoming and current students and their parents. A great selection of food and dessert will be provided in this “Backyard BBQ” styled event. Additionally, we’ll be setting up some fun games, raffles, and a little informal Q&A. For event questions, please contact Nicole Gumbs at npg4@cornell.edu. Come Learn about the origins of Hip Hop culture and its 40-year journey to Cornell’s archives. Ben Ortiz is the Assistant Curator of the Cornell Hip Hop Collection, which is part of Cornell University Library’s Rare and Manuscript Collections division. The CHHC is the world’s most extensive research archive on Hip Hop music and culture (a very broad subject through which a wide diversity of topics can be explored). The CHHC is nearly a decade old and continues to grow each year. It contains an estimated quarter-million artifacts! 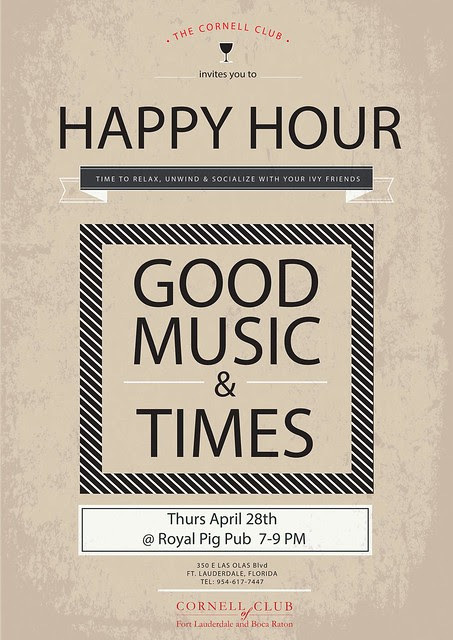 Come connect, kick back, and reflect with your fellow young Cornell alumni at the Royal Pig Pub in Fort Lauderdale. Enjoy some great company, delicious food, and crafty cocktails on Thursday, November 17 with Cornell colleagues and other Ivy Plus, who are warmly welcomed to attend! Mouthwatering appetizers and one drink ticket will be included with every ticket. For event questions, please contact Paula Villarraga (mpv26@cornell.edu) and Marie Parks (mcparks86@gmail.com). For event registration questions, please contact Donna Carl dc37@cornell.edu. Cafe Maxx according to the Zagat Guide to Miami and South Florida, is one of the highest rated restaurants in South Florida and is rated amongst the top regional restaurants nationwide. We will be served a four-course meal and some of the finest Italian wines including, Super Tucans, Brunellos and Chiantis. IMPORTANT: Attendance is limited to 20 people, so don’t wait if you want to experience this incredible value. In August 2015, Cornell Law School’s new Farmworker Legal Assistance Clinic opened its doors under the leadership of Clinical Professor Beth Lyon. In her presentation, Professor Lyon will discuss farmworker policy issues and the cases her students are handling. The Cornell Club of Fort Lauderdale and Boca Raton invites you to a Young Alumni Happy Hour at the Royal Pig Fort Lauderdale. Time to relax, unwind and socialize with your Ivy friends. Join us for good music and good times. $20 Admission includes 1 drink ticket plus appetizers. For event questions, please contact Maria “Paula” Villarraga at mpv26@cornell.edu. We need you to help us persuade this year’s class of admitted students to attend Cornell! We are pleased to invite you to our Annual Admitted Student Reception! Each year, local Cornell Clubs across the country host an event for recently admitted students and their parents. These events provide the space for potential Cornellians and their parents to learn more information about Cornell from alumni. 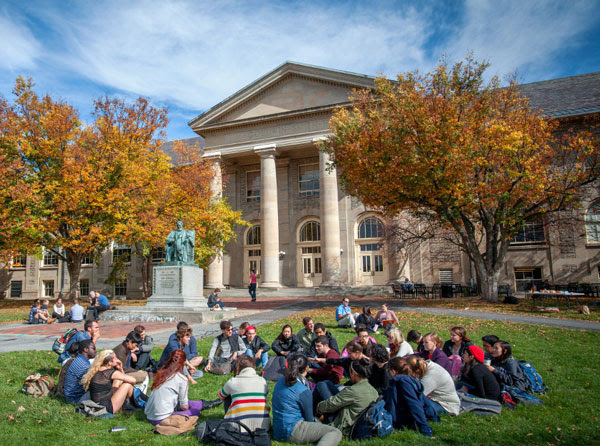 This is usually a time where parents ask alumni the benefits of attending Cornell as opposed to another Ivy League school or a school in the Southeast. Please come out to support one of our annual signature events. If you are a CAAAN member, this is an excellent time to meet some of the students you contacted this fall. Light refreshments will be provided.